Researchers at The University of Texas MD Anderson Cancer Center have shed new light on why pancreatic tumors are so resistant to therapy. The answer may lie in treating a protein found in the scar-type tissue called stroma which often surrounds the tumors. The tumor-associated stroma is comprised mostly of pancreatic stellate cells (PSCs) and its density and possibly the cells themselves are thought to prevent current treatments from effectively killing the tumor. Dickkopf-3 (DKK3), is produced by the stromal cells but acts on the neighboring cancer cells to increase their growth, metastasis and resistance to therapy. DKK3 has been identified as a potential target for treatment with a newly developed DKK3-blocking antibody, according to results from a study led by Rosa Hwang, M.D., professor in Surgical Oncology and Breast Surgical Oncology. Findings are published in the Oct. 24 online issue of Science Translational Medicine. Hwang’s lab found DKK3 to be highly expressed in pancreatic ductal adenocarcinoma (PDAC), the most common type of pancreatic cancer, and specifically by PSCs rather than cancer cells, and her team discovered different ways to silence DKK3 from acting on cancer cells as well as immune cells in the tumor microenvironment. 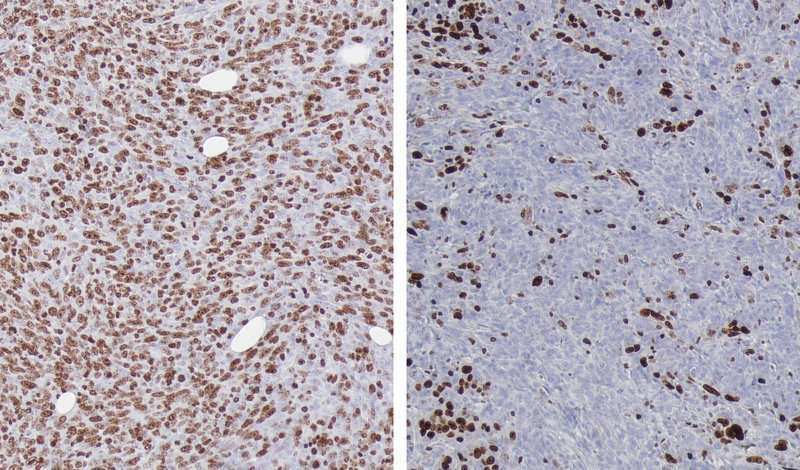 The researchers developed an antibody to block the DKK3 molecule in mice, which not only inhibited tumor growth but also significantly prolonged life. Hwang’s team examined DKK3 expression in human pancreatic tumors and found that at least two-thirds of patients had moderate-to-very strong levels of DKK3. Compared to normal controls, DKK3 levels were 4.5 times higher in PDAC. Due to DKK3’s dual effects in promotion of tumor growth and in resistance to therapy, Hwang’s results indicate that DKK3 is a therapeutic target as either monotherapy or in combination with immunotherapy or chemotherapy.